As we approach 2019, forces are shifting the way companies market themselves and execute sales. And as always, it’s those that embrace change, adapt, and learn quickly that put their companies ahead of the curve. What’s Driving Change in Sales + Marketing? The SAAS, subscription-based model allows companies to better service clients throughout the lifecycle of the relationship?—?it’s not a new concept, but it is becoming more prevalent. With it comes a new strategy where firms look to funnel in potential customers into their platforms quickly via free/discounted trials and pilots. This allows prospective clients to to get a sense of the value of the product and more easily create fans. Businesses now collect and analyze their own sales and marketing data to constantly improve the way they engage with people. This has led to leaner sales and marketing orgs with an emphasis on scaling the right engagement channels instead of employing a series of ‘spray-and-pray’ sales tactics. Marketing and sales leaders are now more akin to ‘growth hackers’, looking for new channels and guerrilla-like tactics to grow their teams’ effectiveness and engagement. Whereas teams relied on sales reps to repetitively prospect, outreach, and engage with leads, technology has proven more effective at these tasks. Automation tools now exist in reaching out to the right folks at the right time with personalized content, with humans intervening only at the necessary steps?—?this is what ScaleRep deems the ‘growth assembly line’. So, how can teams utilize these forces for their benefit? What principles can we keep top-of-mind to best grow our companies? Subscription-based models coupled with trials/pilots have changed what the typical ‘sales funnel’ looks like. 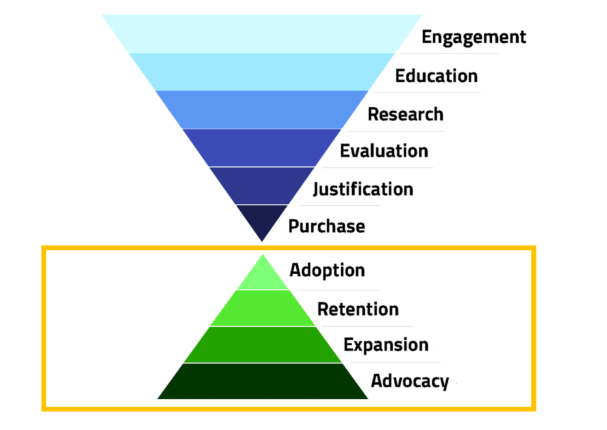 It used to be that the classic funnel marketing/sales teams tracked include steps starting at awareness/initial engagement and ended with the purchase of a good. There are now 2 parts to the new hourglass model: (1) providing direct value to someone through a ‘soft-sell’ and initial purchase, and (2) constantly engaging and retaining current customers to become loyal users. Trials and Pilots are the soft-sells to easier route prospects into your world and have them directly experience your value, but it’s now half the battle. Marketing and sales teams need to shift resources towards the second part of this funnel?—?the engagement that occurs during the soft-sell process. Truth-be-told, this post-soft-sell engagement doesn’t stop once someone goes from trial to customer?—?it’s an ongoing venture. In our subscription-based world where customers pay periodically, companies need to focus on providing value as well and winning their clients over every month, every quarter. A frequent trap we see in organizations is the siloing of each of these 3 departments. In the new hourglass engagement funnel, these perceived different departments are more closely intertwined and need to interact effectively! And because technology makes it a lot easier to reach more people at scale with personalized messaging, the lines between marketing and sales becomes even more blurred. It’s so important that your marketing and sales teams are in complete sync and are aligned with your growth strategies. Do your teams know when the other is interacting with leads? Are handoffs happening such that no lead is falling through the cracks? Is the messaging between teams consistent? How are client success managers engaging with clients once a lead becomes a customer? There is no guaranteed path in successful customer engagement and conversion from prospects to clients and lifelong brands. But the best way to increase your odds at finding successful ways to do so is through testing different tactics and different outreach channels. You will get unexpected results, you will come across strategies that are counter-intuitive, and you will come across a few strategies that work?—?and definitely don’t work! So long as you improve your metrics through calculated tests, you can start to increase and predict conversion in every part of its sales pipeline. Good testing will yield good methods of engagement, your target customer personas, and messaging that works! All these varying factors can be tied with analytics to paint a story of what yields the highest returns. Do more of what works, stop doing things that aren’t as effective. Try new tests. And repeat. In the end, organizations that are made up of the best learners will be those that withstand the tests of time and will best utilize the new hourglass funnel. ScaleRep helps teams build and automate their engagement machine, which serves as the top layer in the new hourglass sales/marketing funnel. Our platform manages all activity at the top of this funnel with essentially zero time needed on the part of our clients. Our clients love working with us because we replace anywhere from 30%-100% of the top-of-the-funnel workflow and have better results than in-house SDR team, with better ability to test messaging and cadences. Interested in learning more? E-mail us at info@scalerep.com, or schedule a demo to learn about the ScaleRep platform!